Join us as we head out on David Thompson Country's most popular hike with great views, narrow canyons and waterfalls. 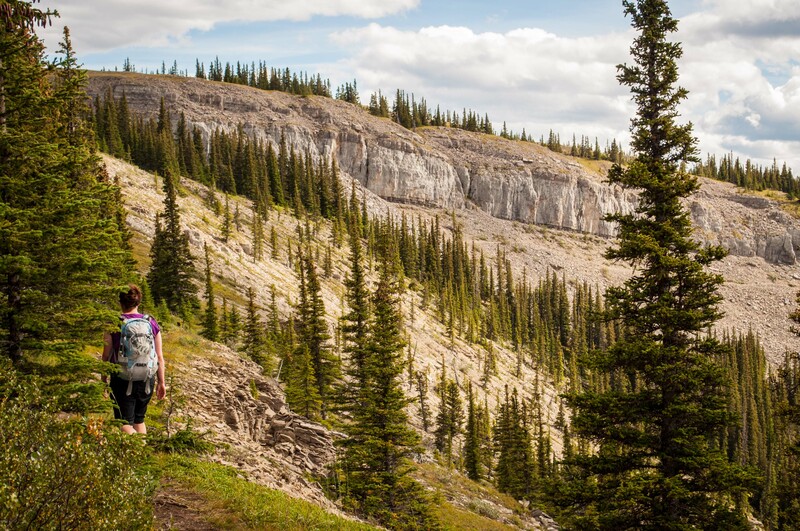 This is an easy 8 km hike taking us along the Kootenay Plains and up the Siffleur River valley. We'll be taking our time on this tour, sharing stories about the area's natural and human history as we make our way past the popular falls to a great little lunch spot. The tour includes your guide, a gourmet lunch and hiking poles. We offer transportation from Red Deer, Rocky Mountain House and Nordegg or you can meet us at trailhead. See the popular Siffleur Falls. Good potential to see elk, bighorn sheep and more. Perfect for: Anybody looking for a fun day playing outside. No prior hiking experience required. This day trip is open to all ability levels, whether you are a beginner and or an expert. You must be comfortable walking 8+ km in a variety of conditions. This tour is recommended for those 13 or older. Meet at the Trailhead This option is available if you'll be driving yourself to the trailhead. You'll be meeting your guide at 10:15 am at the Siffleur Falls Staging Area. The longest pedestrian suspension bridge in Alberta takes us across the North Saskatchewan River. No need to worry if you're not a fan of suspension bridges, this one is fairly low and very stable. The Kootenay Plains are a very fragile environment and protected as an ecological reserve, the second highest level of environmental protection in the province. Alberta Parks has built a boardwalk across this dry, hot and windy area. The trail meanders through the forest before making it's way to a series of viewpoints along the Siffleur River and its canyon. The Siffleur River enters the narrow canyon at the lower falls where viewing platforms allow us to get some great views. This is the end of the trail for many visitors to the area but we'll be going a short distance upstream to find a quieter spot for lunch. A short distance from the falls a new canyon is forming. The area makes for a great spot for a break and to relax before we make our way back to the trailhead. The standard group size is 1 guide with up to 12 guests for this tour. This tour is recommended for those 13 and older. Contact us for options for younger guests. Transportation varies with the group size and can be in an SUV, mini-van, full size van or small bus depending on the day. All bookings are non-refundable but we will offer you a credit for a future adventure if you cancel a minimum of 72 hours prior to departure. Cancellations within 72 hours, including no-shows, will forfeit the tour fees. Tours in The Explorer Series usually require a minimum of 4 guests to run. In the event of low bookings we will contact you the day before the tour to cancel. You'll have the option of a full refund or a credit for a future booking. Waivers are required for all participants.You can review the waiver here. Additional waivers may be required to be signed on the day of the tour prior to taking part in activities offered by other providers. Please review our complete terms & conditions prior to booking.